Proper stain treatment will keep clothing looking new longer. Just follow these easy stain removal tips to get out everything from oils to mustard. Pretreat promptly. As you sort laundry, be on the lookout for stained items; pretreating is the best and easiest way to remove stains. A trip through the washer and dryer can turn a dribble of salad dressing into a permanent addition to a blouse if it’s not treated first. Oily stains. Salad dressing, lipstick and auto grease create oily stains on clothing – and so does your neck on the inside of a shirt collar. To treat collar rings and oily stains, apply liquid detergent directly to the soiled area. Allow the item to stand for 15 minutes before laundering. The detergent will loosen and dissolve the soil so that it can be lifted away in the wash. Protein stains. When Baby spits up on your shoulder, you’ve got a protein stain. Blood, milk and dairy products, and most body soil contain organic matter that will harden and set over time or when exposed to hot water. Soak protein stains in cold water for at least 30 minutes before laundering. A tip from the nursing profession: stubborn, dried-on blood stains may be removed by applying a 3 percent hydrogen peroxide solution (sold in drugstores for wound care) to the stain, but pretest fabric for color-fastness, first. Tannin stains. Tannin puts the pucker in your tea – and permanent color on your clothing if you spill it. Wine, coffee, tea, soft drinks, fruits and fruit juices commonly cause tannin stains. Pretreat them by soaking in cold water, then wash in the hottest temperature appropriate for the garment. Dye stains. Loll on the grass some summer afternoon, and you’re apt to get up with a grass-green dye stain, compliments of the lovely turf. Foods with strong colors, such as blueberries or mustard, create dye stains. So does direct transfer from fabric or leather, such as the blue cast rubbed off on white undergarments worn beneath new jeans. Pretreat dye stains with direct application of detergent to the stained area, then wash in the hottest water appropriate for the fabric. Keeping a family in clean clothes isn’t just a never-ending chore; it’s a major consumer of energy and natural resources in the household. Focus on these strategies to stay clean and green in the laundry area. Chill out. Heating water for household use is a costly proposition, so turn down the thermostat on the hot water heater. For most households, a setting of 120 degrees F is adequate-and lower hot-water temperatures make scald injuries much less likely to occur. By turning down the thermostat, you’ll save energy whenever you launder with heated water. Stay cool. Wash in cold water whenever possible. New detergent formulations for cold-water washing dissolve well and get clothes clean at lower temperatures. Even when heavy soil or fabric type requires washing in hot or warm water, a cold-water rinse saves energy. Bonus: cold-water washing preserves fabric colors. Fill ‘er up. Wash full loads of laundry, you’ll use proportionately less water and energy than doing several partial loads. Cycle down. 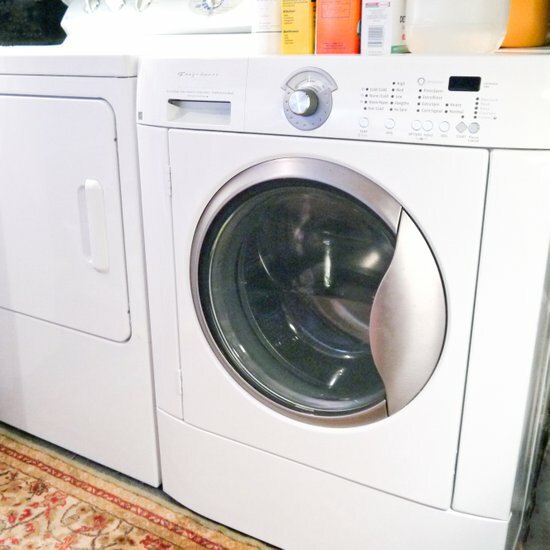 Make good use of the washing machine’s alternate cycles for best energy savings. Permanent press or delicate cycles are shorter, and agitate and spin less than “heavy wash” ones. Use them for lighter-weight or lightly soiled garments. Measure twice, wash once. In the laundry room, more isn’t better when it comes to the amount of detergent or other laundry additives you use, so measure carefully. Too much detergent won’t clean clothing any better and will be hard to rinse away. Chlorine bleach eats away fibers if over-used. Too much fabric softener can stain clothing; rewash to remove spotting. Clean and green. A green hint: use a cup of white vinegar instead of commercial fabric softeners. Vinegar cuts detergent residue, softens clothing, and removes odor-and at a price point far less than commercial products. Let the sun shine. Sunlight and fresh air dry clothing for free-and the warm scent of sun-dried clothes is a sensory bonus. When possible, hang laundry outdoors to dry. Hang loose. Don’t over-fill an automatic dryer. Crowded with clothing, the dryer will have to work much too hard, and leave clothing with wrinkles that can require ironing. Let clothes tumble freely for most efficient dryer use. Enough is enough! When using an automatic dryer, don’t over-dry clothing. 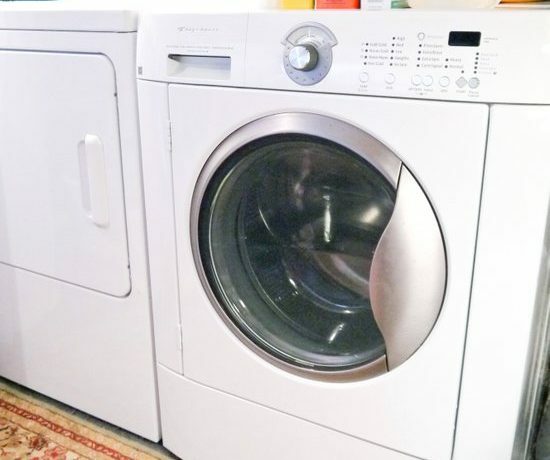 “Auto” settings sense moisture levels and temperature inside the dryer, so use them when possible. Over-drying clothing can cause shrinkage and fabric damage, so save your clothes and the environment by removing dried clothing promptly. Free the filter. Clean the dryer’s lint filter with every load. A lint build-up impedes air circulation and forces the dryer to work longer and hotter. Every month, rinse the filter; you’ll be amazed at the volume of lint that you’ll remove. Vent it. Check the dryer’s vent hoses and outlet hood for lint buildup or obstruction. If the hood cover won’t open freely, replace it. Proper ventilation is necessary for efficient drying and will save energy.